Project Requirements: Your project must represent the content covered throughout this unit of study. Make certain to clearly present the ideas of the how the Reformation "spread" as well as its "impact" on Europe. This video is rather informative and boring...Sorry. The Reformation brought lasting change to Europe. Through the influence of Europeans, it also affected other parts of the world. Religious Wars and Persecution The religious divisions of the Reformation led to a series of wars and persecutions during the 16th and 17th centuries. Catholics and Protestants alike persecuted members of other denominations, as well as each other. Many people died for their beliefs. Others, like the French Protestants who moved to Switzerland, fled to other Protestant countries. Bloody civil wars erupted in many countries. In France, for example, wars between Catholics and Protestants between 1562 and 1598 left over a million dead. The wars in France were not just about religion. They were also about the power of the Catholic monarchy. Similarly, the last major war of the Reformation was both political and religious. Called the Thirty Years’ War (1618–1648), it was fought mainly in Germany. The war pitted Catholics against Protestants, and Protestants against each other. But it was also a struggle for power that involved most of the nations of Europe. Nations fought for their own interests, as well as for religious reasons. Catholic France, for example, sided with Protestants to combat the power of the Holy Roman Empire. The Thirty Years’ War ended with the signing of the Peace of Westphalia in 1648. This treaty called for peace between Protestants and Catholics. By deciding the control of territory, it set boundaries between Catholic and Protestant lands. Most of northern Europe, including much of Germany, was Protestant. Spain, Portugal, Italy, and France remained Catholic. So did Bohemia, Austria, and Hungary. This religious division survived into modern times. The Rise of Nationalism and Democratic Practices The spread of Protestantism went hand in hand with a growing feeling called nationalism. More and more, people identified with their nation, rather than with their local area or lord. Throughout Europe, official state religions strengthened national unity. Along with nationalism, monarchies were also growing stronger. Protestant rulers claimed authority over religious, as well as secular, matters. Even Roman Catholic rulers became increasingly independent of the pope. These changes led to what is often called “The Age of Monarchs.” Monarchs revived the old idea of the divine right of kings. According to this idea, rulers received their authority directly from God. This way of thinking reached its height in the late 17th and early 18th centuries when some rulers established absolute monarchies. Yet the Reformation also planted the seeds of democratic ideas and practices. Beginning with Martin Luther, Protestants emphasized being true to the Bible and to their own consciences. This belief made people more willing to fight for their own ideas and rights, and to resist authority. Some persecuted groups sought freedom to worship in their own ways. For example, the Calvinist Puritans fled England for North America in search of religious liberty. Many Protestant local groups, or congregations, insisted on their right to control their own affairs. In addition, the leaders of Protestant churches were elected by congregation members, not just by the powerful. Such beliefs about religious freedom and church government helped pave the way for democracy. 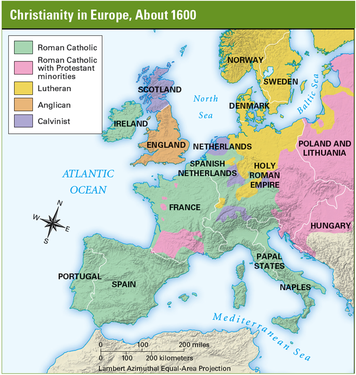 The Spread of Christianity By the time of the Reformation, Europeans had embarked upon a great age of exploration. As they voyaged around the world, both Catholics and Protestants worked to spread their faith. By the 1700s, there were missionary societies in several European countries. Jesuit missionaries were particularly active in spreading Roman Catholicism. Jesuits traveled to India, China, Japan, and Southeast Asia. Protestant missionaries worked in Ceylon (now Sri Lanka), India, and Indonesia. The religious divisions in Europe were repeated in areas controlled by Europeans around the world. This was especially true in the Americas. Most people in English colonies in North America were Protestant. Missionaries and settlers from France brought Catholicism to parts of Canada and the Mississippi Valley. The Spanish and Portuguese brought Catholicism to the American southwest, Mexico, and South America. These patterns of religious faith are evident today.